For the second year, I’m participating in The Great Food Blogger Cookie Swap! Last year I was paired with two other bloggers both stationed in Europe but this year I’ve got a fabulous new group of food bloggers to send to! You must check out these ladies & their blogs! The things they come up with are AH-MAY-ZING! I didn’t even realize it, but Sara has made a cookie similar to the ones I’ve made for the cookie swap! 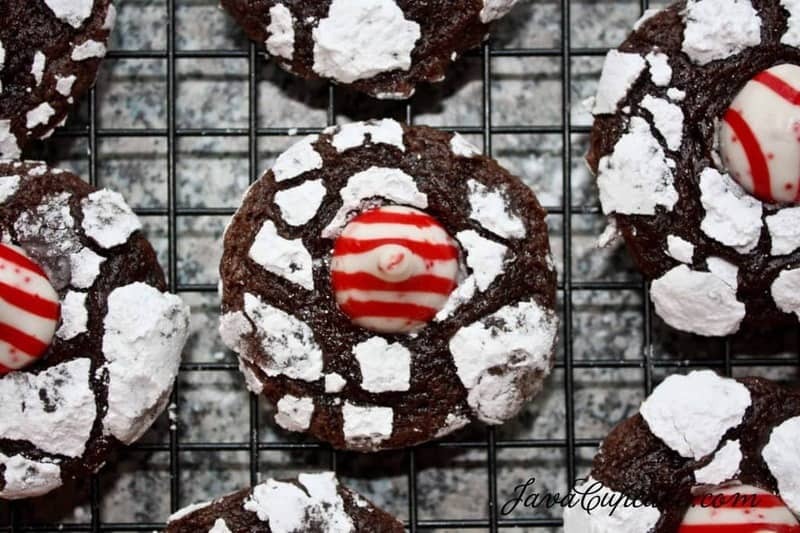 Check out her Chocolate and Peppermint Blossoms! She also has a ton of other great dinner and side dishes ideas. I think I need to bookmark her blog for next week’s meal planning! Audra is a baker after my own heart. Seriously, everything she posts on her blog… I want to bake. Recently, she posted a recipe for a Cranberry Meringue Pie. I mean, WOAH. Cranberry pie!! I think I need to make this… ASAP! A blog all about chocolate? Have I died and gone to heaven? I think so! TammyJo shares so many mouth watering ideas for ways to use chocolate that I never even dreamed of… including these Chocolate Waffles! 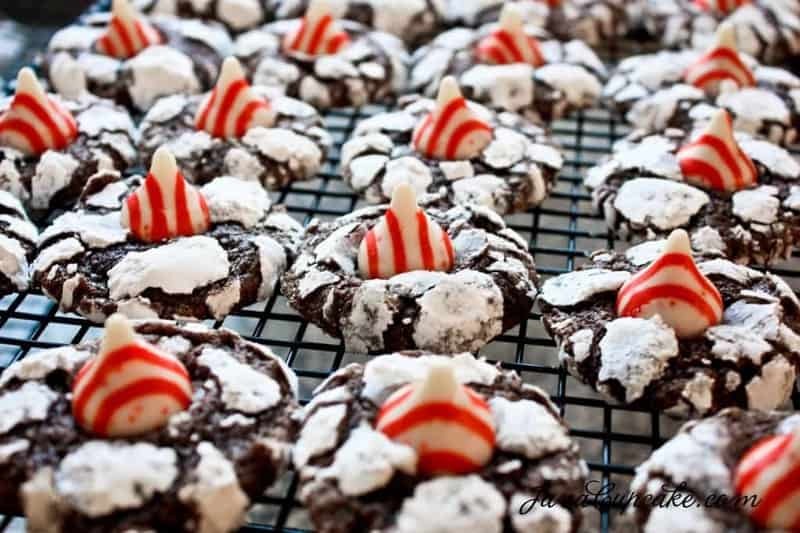 The cookies I made for this Cookie Swap are a spin on my favorite Christmas cookie, the Chocolate Crinkle. I took Betty Crocker’s recipe from my 1963 Cooky Book and added some peppermint then topped them with a Hershey’s Candy Cane Kiss chocolate! 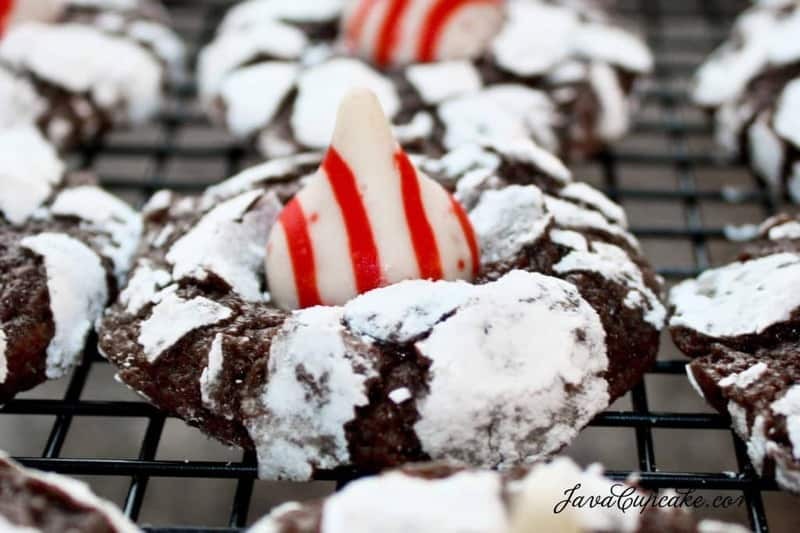 These Candy Cane Crinkle Blossoms are the perfect combination of chocolate and peppermint for the holidays! In the bowl of a stand mixer, mix together the sugar, oil and melted chocolate. One at a time, add the eggs. Mix well and scrape the sides of the bowl after each addition. In a medium bowl, whisk together the flour, baking powder, salt and espresso powder. Add the flour to the chocolate mixture and mix until smooth and combined. Chill at least 8 hours or overnight. When ready to bake, preheat oven to 350 F degrees. Line cookie sheets with parchment paper. Unwrap 5 dozen Candy Cane Kiss candies. Roll teaspoon sized balls of dough in your hand. Toss them in powdered sugar until they are coated. Arrange them on the cookie sheet 2 inches apart. Immediately press a Kiss into the center of each cookie. Allow cookie to cool on the cookie sheet for 2 minutes then carefully remove to a wire rack to cool completely before storing. Thank you, Lauren! 🙂 They were so delish! Happy Holidays! Such perfectly holiday spirited cookies!! These look incredible. What a fun twist on a classic recipe! I can’t wait to participate in the cookie swap next year! They arrived safely to me today, Betsy. They look great and smell lovely but they’ll have to wait a bit longer since we are heading out to a holiday party here in just minutes. I’ve updated my original post to show your cookies and link back to you. These cookies were so soft and minty and delicious! Thank you so much for sharing these with me. I love the texture of these cookies and the powdered sugar kicks it up a notch. And they all made the trip okay! Yay! I’m so glad they made it to you! <3 Happy Holidays!